Jersey Boys is probably one of the biggest and well known Jukebox musicals. It had a significantly long run on Broadway from 2005 to 2017 and has garnered two U.S. tours. In 2014, Clint Eastwood (Yup...Clint Eastwood) directed a movie adaptation. In 2006 it was nominated for a plethora of Tony awards and even won four of them including Best Musical. Hennepin Theatre Trust continues their trend in bringing the Tony Award winner for Best Play to the Twin Cities. I believe last season was the first time they did this with the play The Curious Incident of the Dog at Night Time. This year Stephen Karam turn with his award winning play, The Humans. I was very intrigued going into this production for one main reason: it was a play...and it was at the Orpheum. I personally have never seen a play there before. I'm used to big flashy musicals with dance numbers and numerous costume changes. This was an interesting change of pace for what I'm normally used to seeing. The Humans takes place in an apartment in New York City, specifically lower Manhattan, during a families seemingly harmless Thanksgiving dinner. Erik Blake, the father of the family, breaks tradition and changes it up this year by bringing the family to his daughters apartment in NYC versus having everyone over to theirs in Pennsylvania. As the day continues, the Blake family soon realizes that everyone has their secrets and their deepest fears soon come to reality. Let me start by saying that I've been writing for many years. I work in public relations which means I basically write and communicate for a living. However my skill level as a writer is no where near the caliber it should be to explain how utterly amazing this play is.This beautiful script is written by Stephen Karam and deserves every award it won including Best Play for the Tony Awards, New York Drama Critics Award, Drama Desk Award, Outer Critics Circle Award and the Drama League Award. A semi finalist for the Pulitzer for Drama as well! The production was a refreshing take on the human connection, especially between family members. It deals with sickness, loss, religion, the economy and more themes that no matter where you come from, you'll end up saying "Oh that so sounds like my family." This new American classic will, and should, be studied in every single theatre undergraduate class available with it's riveting dialogue and exceptional raw scenes. It was relatable, real, raw and full of emotion that had me hooked from start to finish. I will admit, I don't see plays too often. A large majority of the shows I see are musicals and this play rejuvenated my drive to see more powerful stories like this. While it was full of emotion, it had a lot of comedic moments as well which I loved. Some of the lines a little darker than others but the comedic timing and acting of the cast made it simply superb. Speaking of the cast, could they have been more incredible? There family dynamics and chemistry were so on point, you'd think they were actually real life blood related. The cast really brings Karam's scenes to life as they fight one moment only to laugh and change the topic the next. I think we can all relate to these scenes so well with our own families which makes this production all the more relatable. Couple highlights from the cast specifically include Pamela Reed who plays the mother, Deirdre Blake, of the family and she's probably my favorite. Her delivery, dedication to her kids and love for them shined through the entire production. Richard Thomas plays the father, Erik Blake, and proves to be a perfect father figure with the perfect amount of love for his daughters. Together these two form a beautiful couple, who despite their issues (won't spoil it) they seem to always try to put their family first. Lauren Klein plays, who plays Fiona "Momo" Blake, is the ailing grandmother with Alzheimer. While she is quiet or sleeping for a majority of the show, her character is so important to the overall dynamics between everyone. She also was in the original cast on Broadway! The Humans runs about 95 minutes and has no intermission. Typically Broadway plays don't go on a National Tour so you know that it's got to be fantastic just for that fact alone. Tickets for this production are still available and can be bought here. The Humans runs through Feb. 13 - Feb. 18. SIDE NOTE/FUN FACT: I think it's hilarious that on the eve of Valentine's Day (aka Galentine's Day) I saw a play with Pamela Reed who plays Leslie Knope's mother on the hit show Parks and Recreation. 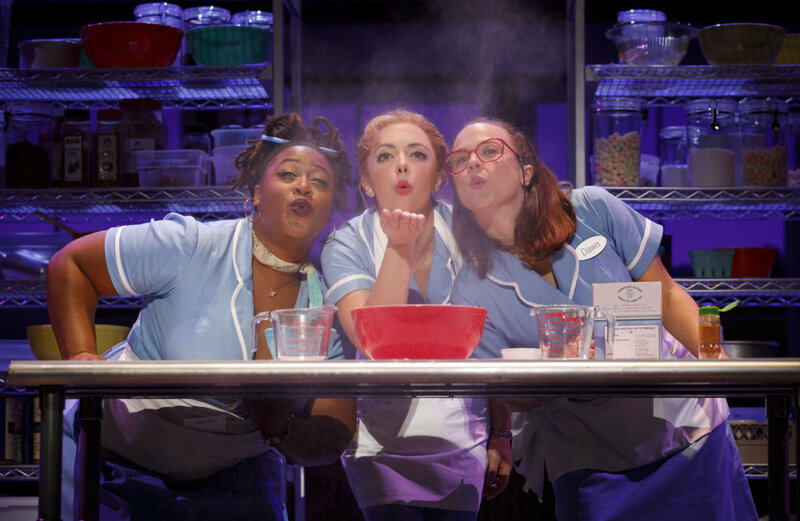 One of Broadway's longest-running and highest-grossing musicals (approximately over $1 billion) is back in Minneapolis and bigger than ever. That's right, Andrew Lloyd Webbers stunning masterpiece has returned and I honestly can't even handle how amazing it is. I saw the last tour and I was blown away from the back row in the balcony. This time I was even closer (sixth row) and was once again amazed by the sheer genius of this production. I think a lot of people underrate The Phantom of the Opera. It's a musical that a lot of theatre fans think "Yes. Phantom. It's a great show." But really when I see it or listen to it I can't help but geek out about it. The score is beautiful. The lyrics are stunning and (when done right) the set is superbly superior than many other musicals. This production is a thrilling new production with newly reinvented staging and stunning scenic design. It includes a cast and orchestra of 52, making this one of the largest productions currently on tour. For those who aren't familiar with the production, it is originally based off of the classic novel Le Fantome de L'Opera by Gaston Leroux. Phantom of the Opera tells the story of a masked figure who lurks beneath the catacombs of the Paris Opera House. He falls madly and deeply in love with ballet dancer in the chorus and is also a young soprano, Christine. He devotes much of his time to nurturing her talents and teaching her how to be an incredible singer. However when a new creative duo purchase the Opera house and an old friend of Christine arrives, how far will the Phantom go to keep control? Derrick Davis plays the Phantom and is stunning, brilliant, incredible, amazing, show-stopping--need I go on? He plays the Phantom with the perfect balance of romance and creepy stalker. At times you see his love for Christine and it feels genuine and other times you realize how much of a tortured soul he is. Davis is also the first African-American I've seen in the role and it's refreshing (similar to the Ordway's choice to cast Warbucks as an African-American male) to see. Davis has one of the most versatile voices I've heard in many years. He truly can sink to a rich deep tone while soaring above to new notes in a beautiful falsetto. 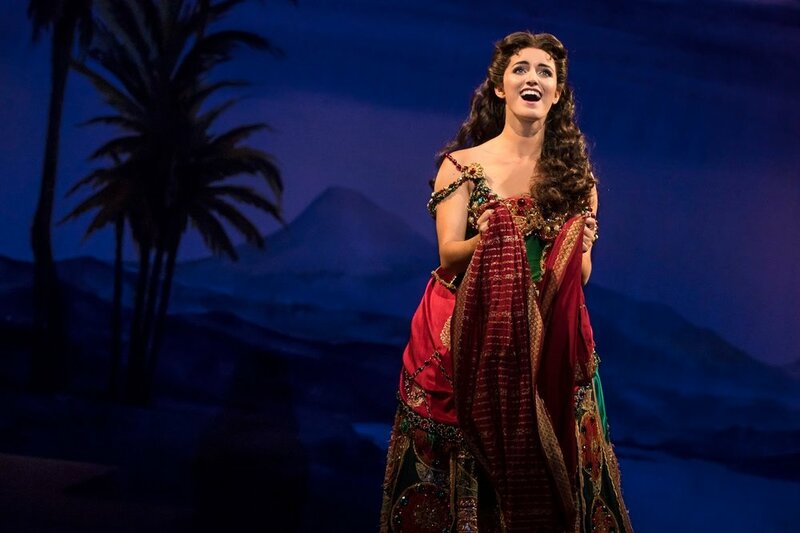 Eva Tavares places Christine Daae and does so beautifully. Her acting is innocent until the end where she becomes even braver than she started. The most impressive thing by far is her soprano voice. I think a reason why I love this production so much is it lets actresses of a different caliber shine. It's not about how long and loudly they can belt and riff. It's just a nice change of pace between most of the type of musicals I see. She has absolute control of her voice with each note and phrase and it's absolutely breathtaking. What is better than these two separate? Well, when they are together, of course. The minute we hear that oh familiar organ playing the title song I can't but help to smile. Every single member of this cast is on fire including the ensemble. My absolute favorite song from this musical is Masquerade and this cast did not disappoint. It's a blur of fabulous costumes, beautiful set pieces, and fantastic harmonies. This song really shows off the whole cast very well especially leading into the Phantom's menacing entrance. There are a few pieces from the original production that are over 245 years old used in this production. The show has won more than 70 major theater awards including seven 1988 Tony Awards, including Best Musical. The chandelier has over 6000 beads (632 on each strand) and it weighs 1 ton. The Phantom of the Opera is a magically breathtaking production and should be seen by anyone who considers themselves a sliver of a theatre fan. Luckily this production runs a bit longer than a large majority of Broadway Across America productions with a three-week engagement. It runs through December 31st. More information, including how to buy tickets, can be found here.